Our semiannual Giants business trend reports examine results over time but tend to focus on the previous 12 months. 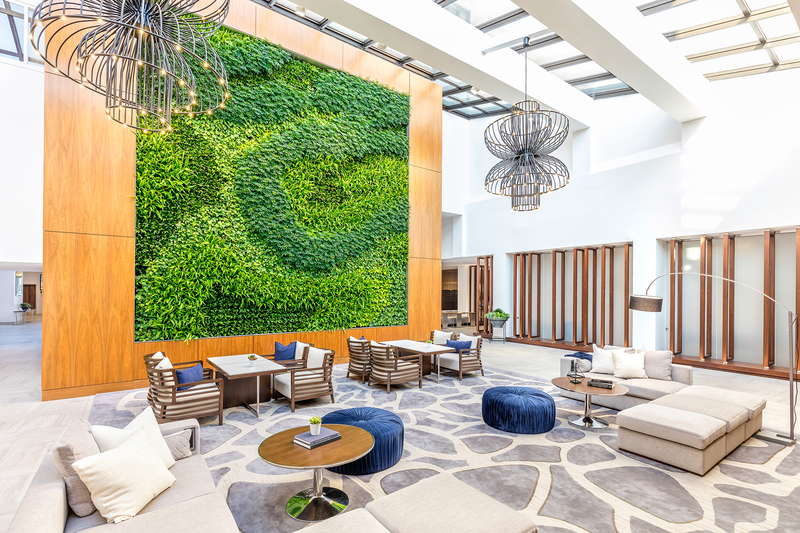 Before we begin that trip down short-term memory lane for Interior Design’s Hospitality Giants, let’s do something different: Pay tribute to just how big a business hospitality has become for design firms in general. Of the 200 biggest firms we can report on here, 70% work in hospitality. Those projects generate a quarter of their total fees. Since 2001, hospitality fees as a percentage of total revenue have risen 73%. It’s not just a good chunk of the design business overall but it’s also been one of the primary drivers of growth over the past 15 years. Anyone who follows our trend reports with any regularity knows that business has been terrific over the past five-plus years, and that’s one big reason we track the 75 biggest hospitality firms. Their business reflects everyone’s business. Business continues to be good. Total design fees for Hospitality Giants hit $2.03 billion last year, topping the $2B mark for the first time. Of that total, 36% came from hospitality work, and firms expect to do an even higher percentage next year. The $722 million in hospitality fees is yet another new record for the Hospitality Giants, up from $684 million last year. They anticipate a 10% bump next year to $792 million (and $2.1 billion overall). As usual, the luxury ($169 million) and boutique ($101 million) categories form the majority of the $392 million in hotel work. This is the segment’s foundation. Nearly eight out of 10 Hospitality Giants do this work, and more than half say that they’re doing more of it than they were two years ago. And they expect further growth next year. Restaurants (15% of fees) and resorts (10%) are the next-most robust revenue streams, with spas, bars/nightclubs, gaming cruise ships, and mixed-use all coming in single digits (Hospitality Giants are particularly bullish on the future of condos/time-shares, spas, and bars/nightclubs). Work volume has upped along with everything else. The Hospitality Giants logged 299 million square feet from 5,400 projects last year, an increase from 235 million/5,100. A telling stat: The group only crossed the 200-million-square-foot mark for the first time last year, and next year they’re forecasting 317 million. Meanwhile, the total project numbers have risen every year since we started keeping track in 2010. Back then, it was 1,900 jobs. Next year the Hospitality Giants forecast 5,900. Some more record numbers: The Hospitality Giants installed $23.7 billion in furniture, fixtures, and construction products last year, only the second time that number has increased more than $2 billion and crushing the previous high with $3 billion. Construction products dominated the category—62% to 38% F&F—which is a change from the 50/50 split registered over the past two years. New construction and renovation was an even split, 47% each, but we added a new stat this year: 6% of projects were a refresh of a previous job. Three out of four jobs were in the U.S. last year (the South and West being hotbeds), with a third of all firms exclusively domestic. But 15 Hospitality Giants claim that 60% or more of their work happens outside the States (five of them are based internationally). Firms predicting growth in international work next year total 78%—China, Europe, and the Caribbean are (possibly) where it’s at. With all of this work, you might wonder how staffing has been affected. The answer is big time. The Hospitality Giants employed 11,000 design staffers last year, a 26% gain of 2,300 jobs. They expect to hire another 800 this year. All aspects of a firm’s hospitality design practice, from strategic planning and programming to design and project management. Hospitality design fees do not include revenues paid to a firm and remitted to subcontractors that are not considered full-time staff equivalent. For example, certain firms attract work that is subcontracted to a local firm. The originating firm may collect all the fees and retain a management or generation fee, paying the remainder to the performing firm. The amounts paid to the latter are not included in fees of the collecting firm when determining its ranking. Additionally, where applicable, all percentages are based on responding hospitality Giants, not their total number. The data was compiled and analyzed by the Interior Design market research staff, led by Wing Leung, research director.